The upright RS-G4 research confocal microscope features a new strip mosaic image capture process coupled with its proprietary image-stitching algorithm to create cellular-level images with unprecedented down-to-the-pixel accuracy and perfect homogeneity. The process generates large-scale mosaics that you can use to quickly locate a data collection area on a large specimen, such as a whole brain section. 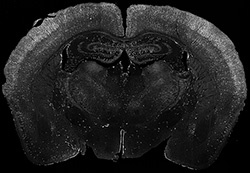 Neuroscience: The high-speed strip mosaic feature of the RS-G4 can scan large areas of whole brain sections in just a few minutes. Full correlation is available to interact from the macro view to zoom into the desired micro cellular detail for various fluorescent stained image views. The mosaics are processed using an image-stitching algorithm to display perfectly aligned images with seamless frame-to-frame clarity. Developmental Biology: Observing animal development has traditionally required taken several instruments to record growth, from high-power microscopes to larger Field of View (FOV) stereo microscopes. The RS-G4 lets you complete the same tasks with a single instrument. It can record confocal imaging at all stages of development, with many fluorophores highlighting cellular development from sub-micron resolution to complete FOVs of 30 x 30 mm and larger, covering micro to macro imaging. In addition to visible wavelengths, the RS-G4 provides an infrared laser (785nm or 830nm) for in-vivo sample imaging with a penetration depth of up to 250 microns (depending on cellular density). The ability to look inside your juvenile or adult model adds new information to your research. Pathology: The RS-G4 supports both confocal reflectance microscopy (CRM) and confocal fluorescence microscopy (CFM) for the ex vivo applications involved in reviewing images of tissue. Translational Research: The near 25 frames-per-second image capture speed and extensive functionality of the RS-G4 bring confocal microscopy to a wide range of new research areas. 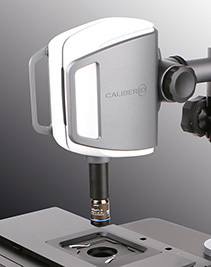 This upright research confocal microscope quickly creates the large-scale mosaics you need to locate and analyze target areas on your specimens. The mosaics are created with a multi-dimensional imaging system driven by high-speed strip mapping software that launches as the first strip is imaged. As each subsequent strip is imaged, the software performs Seam Carving that stitches the fields together with perfect alignment. You get an image with cellular level, down-to-the-pixel accuracy that delivers perfect homogeneity, generated with virtually no delay. Slashing image acquisition time with high-accuracy strip mapping gives you a superior source for analysis, and dramatically reduces the time required to complete experiments. Customers have reported reducing large area imaging times from two weeks to less than an hour. Faster workflow cycles valuable free time and create a better user experience.